The PVTT2U is the most unique record play ever. 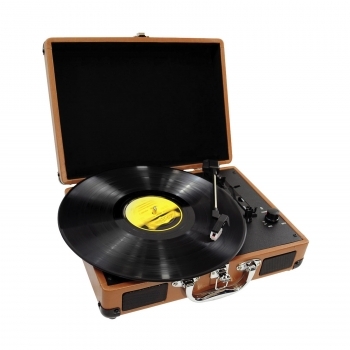 This multifunction turntable plays 33, 45, and 78 RPM records and lets you turn your old music into digital music files using your PC. A USB port allows you to connect this turntable/cassette player to your computer and digitize your music using the free Audacity software. This unit also has a rechargeable battery that uses the USB port to recharge -- plug into your computer or use an AC-USB adapter (not included). This unit is equipped with two stereo speakers for high-quality audio playback. Stereo RCA output allows you to connect this turntable to your home audio system for even bigger sound. It’s all packed into an elegant briefcase-style design that’s sure to turn heads.